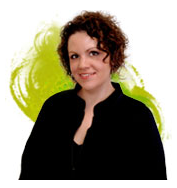 An experienced publication designer, Erin Tinney served as graphic designer at Garbo Design House in Frederick before joining the team at JPD. While with Garbo she worked on magazines such as the Frederick County Guide and most notably she art directed the design and unique layout for Find It Frederick. Erin's skills are not limited to publications. She has thoughtfully put her design talents to work on numerous other design projects including websites and corporate collateral. Erin recognizes the importance of asking the right questions in order to understand each client's specific goals and challenges. Her work has garnered both local and national recognition. Erin is a graduate of Frederick Community College and received Dean's honors while working on both her Associates of Art and a Communication Graphics Certificate. Like many of the other staff at JPD, Erin gives her time back to the community. In 2009, Erin received the Member Appreciation Award from the GFAF for her service. ©2010 Jean Peterson Design. Powered by Blogger.